A cold has been nipping at my heels for more than a week now and it bit down hard this weekend. I can't drink enough fluids today to drown the fever blistering my lips and burning my throat. I managed to drive Coranna to swimming lessons, but haven't done anything else today. This is my first time on the computer and I had planned to finish my on-line class. So much for that, so much for running my 8 miles today either. Instead I read magazines, played Candyland with Coranna, and slept and had strange fever-induced dreams. I do have a poem from Rumi to share. Not surprisingly, I like Rumi. I'm a mystic-lover, though I will confess to nodding off during the Mevlana (whirling Dervishes) in Konya, Turkey, but there's a long story behind that involving men,CaltalHyuk, and carpets. I spent tonight having drinks at a wine bar in Beaumont with a good friend. We had one of those three-Chilean-wines-into-it talks. My friend focused on life journeys and the importance of those people who adhere to you. I understood what she meant. I have had incredible friends who have had my back. But it is more than "have my back" because I think many friendships exist with a huge degree of loyalty and love, but few thrive with loyalty, love, and commitment to lifelong camaraderie. That element of sticking with you and in your life is precious.I even have family members who haven't stuck, and that really bothered me. The love was there, but for some reason that wasn't enough. Sometimes I think about my future and I worry about living alone, but I wonder if my worry is a societal construct or a valid fear. I don't know how to answer that question. I've never been alone. I have always had someone: friends, family, my daughter, my animals. The most alone I ever felt was when I was married, so what does that say? Well, the phone just rang and my sister and her husband want me to go out to celebrate Chris' promotion. As I just wrote, I've never been alone. Life is delicious so in that spirit, I will throw caution to the wind, add a little fairy dust, and throw in a kiss for good measure. We have hesitated to do so precisely because some people will find it predictable. Some may even accuse us of being part of what certain Chinese politicians are cynically deriding as the "Dalai clique." But it would be wrong to assume that we care about Tibet only because of the Dalai Lama's link to that region. In establishing the Vancouver-based DLC, we have been careful to create an organization that is apolitical and secular. The intent is not to laud one political position over another. It is to honour the Dalai Lama's universal teachings - in particular, his insistence on nonviolence. We are speaking out against the use of force and urging the parties to this and other conflicts to choose dialogue as the first step toward resolution. Our objection to what's happening in Tibet is no different than our dismay at events in Darfur, Afghanistan or Iraq - in each case, we have lost the peace. We have lost the values that are most fundamental to the Dalai Lama's teaching: kindness, compassion, patience, tolerance, nonviolence, dialogue, mutual understanding. The DLC is dedicated to righting that balance in a unique way, concentrating on what the Dalai Lama calls "educating the heart." He teaches that if you hope to be a force for peace, you must begin by searching for peace in your own heart. It is from that peace that we later find kindness, compassion, patience, even forgiveness. The current conflict in Tibet presents a challenge and an opportunity, a chance to reward those who have chosen nonviolence and to engage those are still inclined to fight. It is a testament to the Dalai Lama's lifelong teachings that much of the world is united behind his quest for peace and his hope for his people. Against overwhelming physical superiority, it is only the force of world opinion that offers a chance for peaceful resolution. This is no time for brinksmanship. It is seldom the right moment for punishments or threats. It is, rather, a time to say to those perpetuating this conflict that dialogue is the answer. It is also time to make it clear that we are watching - that we may forgive, but we will not look away. Evan Alderson, Victor Chan, Brenda Eaton, James C. Hoggan, Gwyn Morgan, Martha C. Piper and Thomas E. Rafael are trustees for the Dalai Lama Centre for Peace and Education. Do you know someone who might like to be on our e-mail list? Please see the Forward to a Friend link at the end of this e-mail. Wow, there are so many parties in Nepal now! It used to be Gham and Rhuk, now there are 74 parties to choose from. Amazing. My favorite new party is the Rastriya Janasshakti Party because their logo is an umbrella. As a Nepali once said, "the umbrella is to protect from sunlight and rain." One of my main character's, Punchok, carries an umbrella throughout my novel, and he gets teased a bit. When I lived in Nepal, I became an umbrella carrier. The umbrella did protect against the elements, but I also used it to help stretch my back on the long hikes, as a walking stick on the steep hills, and to shoo away water buffalo. Great invention, the umbrella. I wonder if the umbrella will protect a party in an election? Ah, the Nepali Maoists. The Nepali Maoists are in the background of The Secret of The Plains. They "kidnap" Cheng and the journey is, for some of the party, a search for the Maoists. There are many incarnations of Maoists in Nepal. When I lived in Nepal, it is was just before Prachanda gained power as a revolutionary leader. The Maoists were scattered, manned with well-intentioned young men who wanted equality in the villages, and who campaigned in elections. Under Prachanda's leadership, the Maoists hardened into a guerrilla faction fighting for complete revolution. Prachanda's directive was clear: no compromise with the Feudal King or the Inept Parliament. My, my, have times changed. 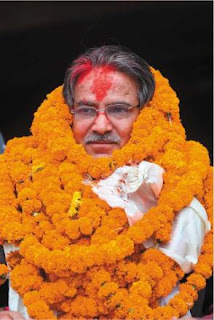 It amazes me that Prachanda has come in from the hills and thrown his name into the elections. What I am not surprised at, is how popular he has become as the new face of democracy. This article is incredibly interesting. An interesting article in The Independent about the UN's new logo for Human Rights. GCHQ analysts believe the decision was deliberately calculated by theBeijingleadership to provide an excuse to stamp out the simmering unrest in the region, which is already attracting unwelcome world attention in the run-up to the Olympic Games this summer. For weeks there has been growing resentment inLhasa,Tibet's capital, against minor actions taken by the Chinese authorities. Committed to teaching the tenets of his moral authority---peace and compassion---the Dalai Lama was 14 when the PLA invadedTibetin 1950 and he was forced to flee toIndiafrom where he has run a relentless campaign against the harshness of Chinese rule. Discovering that his supporters insideTibetandChinawould become even more active in the months approaching the Olympic Games this summer, British intelligence officers inBeijinglearned the ruling regime would seek an excuse to move and crush the present unrest. The doughnut-shaped complex, nearCheltenhamracecourse, is set in the pleasant Cotswolds in the west ofEngland. Seven thousand employees include the best electronic experts and analysts in the world. Between them they speak more than 150 languages. At their disposal are 10,000 computers, many of which have been specially built for their work. The images they downloaded from the satellites provided confirmation the Chinese used agent provocateurs to start riots, which gave the PLA the excuse to move onLhasato kill and wound over the past week. What theBeijingregime had not expected was how the riots would spread, not only acrossTibet, but also toSichuan, Quighai andGansuprovinces, turning a large area of westernChinainto a battle zone. The Dalai Lama has called it "cultural genocide" and has offered to resign as head of the protests against Chinese rule in order to bring peace. The current unrest began on March 10, marking the anniversary of the 1959 Uprising against Chinese rule. However, his followers are not listening to his "message of compassion." Many of them are young, unemployed and dispossessed and reject his philosophy of non-violence, believing the only hope for change is the radical action they are now carrying out. 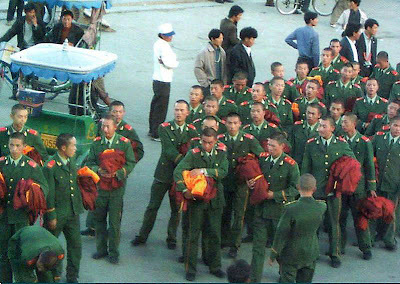 ForBeijing, the urgent need to find a solution to the uprising is one of growing embarrassment. In two weeks time, the national celebrations for the Olympic Games start with the traditional torch relay. The torch bearers are scheduled to pass throughTibet. But the torch could find itself being carried by runners past burning buildings and temples. A sign of this urgency is that the Chinese prime minister has now said he is prepared to hold talks with the Dalai Lama. Just before this announcement,Britain's Prime Minister Gordon Brown declared he would meet the Dalai Lama, who is to visitLondonnext month. This is the first time either leader has proposed to meet the Dalai Lama. This is an interesting article in BBC. This from the site AVAAZ.ORG. Headway! "On Monday, thousands of people in 84 cities worldwide marched for justice for Tibet--and delivered the 1.5 million-signature Avaaz petition to Chinese embassies and consulates around the globe. (Click below for photos.) Avaaz staff have engaged with Chinese diplomats in New York and London, delivering the petition and urging action. And a growing chorus of world leaders is joining the call. China is on the fence--quietly indicating an openness to talks with the Dalai Lama, while at the same time pressuring other governments to support its continuing crackdown. Each day, more leaders are speaking out--either for dialogue, or supporting the Chinese hardline. Click below to send a personal message to your head of government, urging support for dialogue with the Dalai Lama--and check out the photo gallery from Monday's day of action! Together, we've built an unprecedented wave of global pressure. The Avaaz petition is one of the biggest and fastest-growing global online petitions on any topic in history; since it launched on March 18, it has been signed by 100,000 people per day--an average of more than 4,000 per hour, day and night. We're privileged to be alive at a time when people anywhere can reach out and support people everywhere--instantly. If we have the power to make things better, we have a responsibility to act. Thanks for what you've done so far, for the people of Tibet and for a more humane world for all. PS - The more people sign the petition, the more powerful our call for change. We will hope to deliver it to the Chinese government again once we reach our target of 2 million signers. If you haven't already, please forward the email below to your friends and family, and urge them to sign the Tibet petition!"